There are limited permanent moorings available in the harbour. 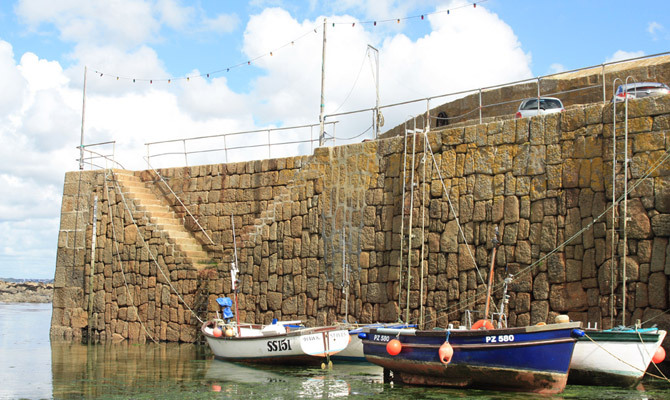 These moorings are restricted to residents of the village and its immediate surrounds and allocation is at the discretion of the Harbour Master. The harbour authority welcomes visiting yachts, although facilities are somewhat limited. Visiting craft should be aware that the harbour dries out and that they should therefore have suitable features (e.g. bilge keels, legs) or allow for taking ground. Important – Dogs are not permitted on the beach at any time of year. The harbour authority has two car parks on its land. The North Pier car park is open all year round and includes parking along the North Pier and on the upper hard stand. The South pier car park includes parking along the South Pier and also in a small area of tarmac immediately above the beach. This area is generally unavailable in the winter months as it is used for storage of boats.